Totora Boats, also called Reed Boats, have been sailing around Lake Titicaca in Peru and Bolivia for thousands of years and are among the oldest known types of boats in the world. They come in all sorts of sizes and constructing a boat is a traditional craft handed down from generation to generation. 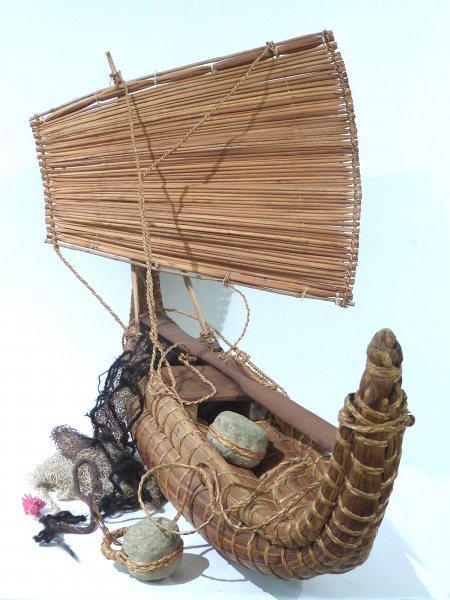 This model is about one teeth scale and was fully fitted out by the present owner with: a seat, paddle, rudder (this is pushed down the centre of the boat to correct drifting), a fishing net complete with a float to keep its mouth open and two weights to hold the bottom down. Totora reeds grow in great abundance around Lake Titicaca and are used for many things, the most interesting being the large floating islands on which people live and work. They are quite solid and do not quake or move when walked on. Thor Heyerdahl used the skills of the Lake Titicaca boat builders to build his RAII in 1970 when he got them to fly over Morocco and build the boat that was successful in crossing the Atlantic.